Of random crap that is. Sorry! The last couple of months have seemed so full, and have gone pretty quickly. 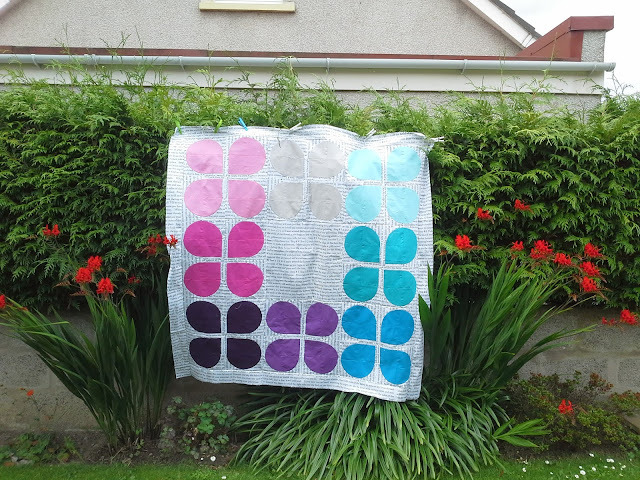 Here is the finished top for the retro flowers quilt. I got the bottom row purples back to front but I'm not changing it, I kinda like it! I had a wonderful visit from Canadian Abroad and her girls - that was priceless. Moo just adored the girls, and it has to be said who wouldnt, they are such a credit to their ma. And I got precious time to sit and blether about non-moo stuff! Yay! Moo has a wee friend now, and there have been some chaotic but immensely fun play dates, mostly involving swings and cake. And fabric chat! Bonus! Posts I will try to write soon will cover Stitch Gathering, probably when you are totally sick of hearing about it... My Low Volume / Scrap Vomit / Charm quilt... What's happening in Brit Bee this year... and Moo. Lots more Moo. Love that Retro Flowers quilt! Glad you survived SG but I bet you're shattered now. P.S. I'm sorry but I almost choked on my tea when I read the 'where's Mammy's boobies' story! Priceless! Love to hear how moo is! The retro flowers look great! She sounds adorable, please do share more.